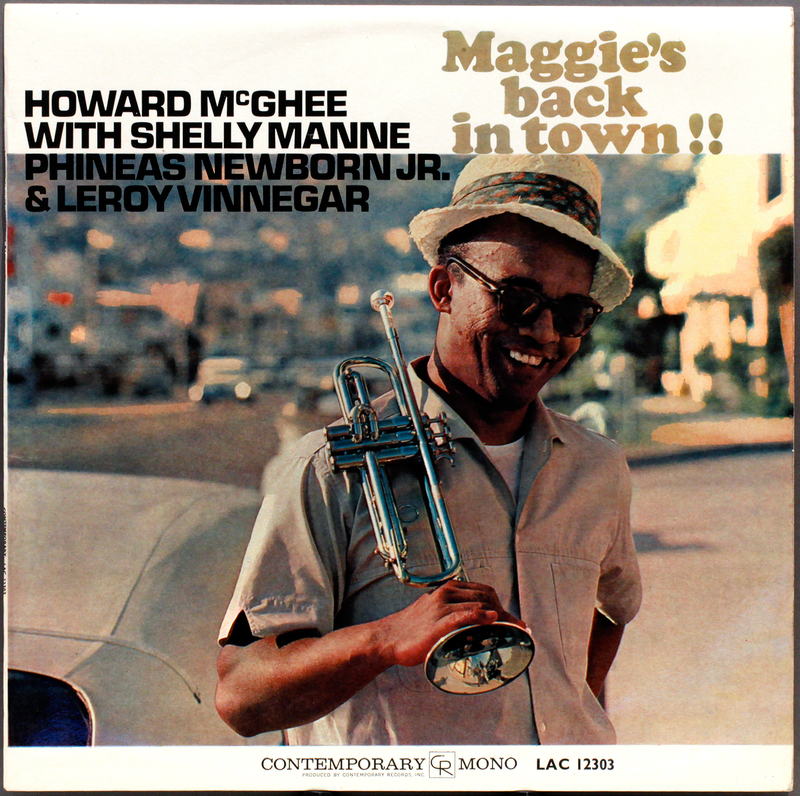 Howard McGhee (tp) Leroy Vinnegar (b) Shelly Manne (d) Phineas Newborn Jr.(p) Recorded June 26, 1961 at Contemporary Records in Los Angeles. 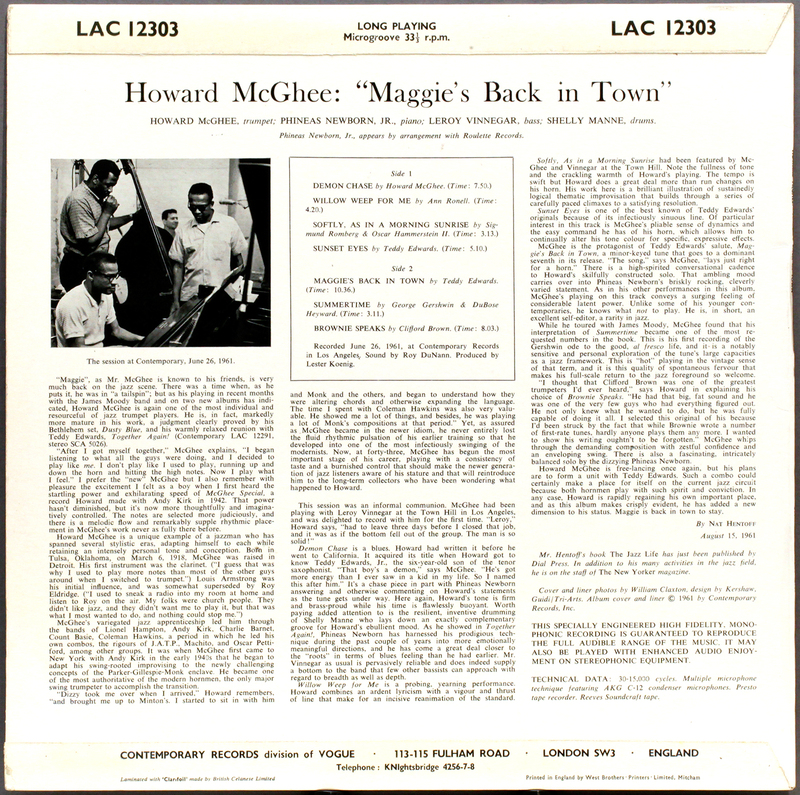 My take: McGhee is an excellent jazz trumpeter, probably best known for his rare Felsted alternate score to Freddie Redd’s Music from the Connection featuring Tina Brooks (bow down and worship at merest mention of “Tina”). His equally rare Bethlehem album “Dusty Blues” (paired with The Connection score on a recent CD release) is an astonishing album too. McGhee is under-appreciated and under-recorded, some of which is probably down to spells on narcotics charges due to a fault in the Criminal Justice system of the day, which put away addicts instead of criminals. Phineas Newborn is also “something else” His dense clusters and rapid flow of cascading notes that tells you you are not listening to any ordinary pianist out of the Horace Silver School of Bop. Critics rounded on Newborn at the time for being too clever for his own good, too academic. Perhaps they were looking for something else, as I find his style is satisfyingly complex. I have three records with Phineas as leader, so it is interesting to hear him comping away supporting the rhythm section role, but you sense itching for his own space to let rip. And he brings an additional level of interest to what might be just another trumpet voluntary. Mono deep groove UK 1st pressing on Contemporary Vogue. Decca fine engineering. Nuff said. I have to admit, the stereo press sounded very good, perfect Roy Dunnan I reckoned, and Goldmine even valued the stereo more than the mono, a foolhardy opinion that is not backed up by even a cursory inspection of Popsike. The soundstage was typical early Stereo extreme – Newborn exclusively on the left, rhythm section together on the far right, and McGhee bang in the centre. Which was fine as long as McGhee is playing. On the extended piano solos of the brilliant Phineas Newborn, sound from each corner, but nothing in between for five or more minutes. If there had been a centre speaker you would have kept walking up to it and tapping it to check it was working. You begin to appreciate how modern stereo engineering gives you more a more evenly-balanced overall presentation. The best case for Stereo seems to me the sound effects programmed into a piece like Jean Michel Jarre’s Ethnicolour on the Aero album. You need to keep your head down as it is not unlike the infamous Omaha Beach scene in Saving Private Ryan, where the first five rows of the audience have to be stretchered out with shrapnel wounds. Or at least thats my idea of stereo.For music, I prefer mono, except for the times I don’t. This entry was posted in Contemporary, Howard McGhee, West Coast and tagged Contemporary, Howard McGhee, Jean Michel Jarre, Leroy Vinnegar, Mono, Phineous Newborn, Shelley Manne, Stereo by LondonJazzCollector. Bookmark the permalink. I must admit (once again) I am not a collector. Of the 300-plus Blue Notes I own, about 80 percent are in CD format, and none of the LPs is an original pressing. So what I am going to say here does not reflect any acquaintance with “originals” except in the shape of LJC’s generous rips. Still, there’s more than a grain of truth in the statement made above. To my ears, Roy DuNann always sounds good, while RVG has disappointed me time and again, exactly the way Carter puts it. I know what I’m saying is blasphemy. Listening to original pressings might have taught me otherwise. Or would it? I know its been awhile, but did you happen to recall if the stereo and mono jackets were identical? I picked up an original stereo yesterday ($8!!!) and the title text is in Orange. Your copy has the title text in light brown. Just curious. The amazing Marvo, miracle feats of memory, reaches back two and a half years and remembers … whether the liner notes were a different colour.. Sorry, I don’t recall. I know there is an important issue about coloured text with original Art Pepper meets the Rhythm Section, but I didn’t notice anything in this case, but I wasn’t looking at it with todays eyes. I’m just annoyed I sent back the stereo, I wouldn’t do that today, I’d have them both. cuyahogabend: are the labels of your copy green or black? It would guess they are green, since the initial issues had a cover with a gold coloured title (or light brown, if you prefer). 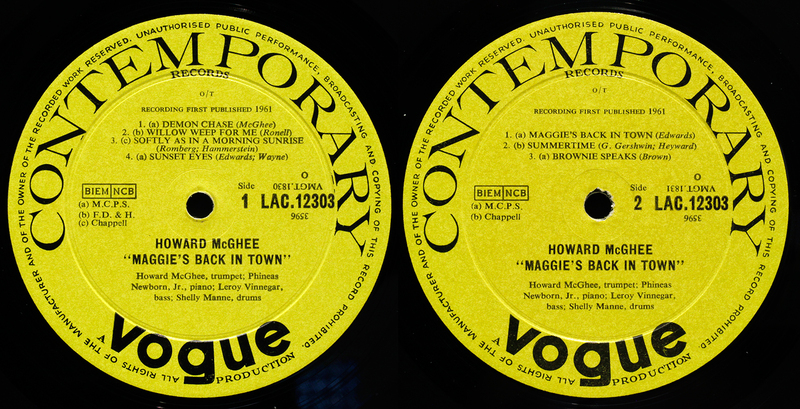 Second issues had an orange coloured title, which I would therefor expect to have a green label. Just curious. that is very interesting, I incorrectly thought the orange lettering was a later novelty. Your album then is very special. Enjoy it!